Ukrainian President Petro Poroshenko, left, greets people gathered to support an independent Ukrainian church near the St. Sophia Cathedral in Kyiv, Ukraine, Saturday, Dec. 15, 2018. 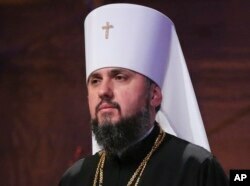 Ukrainian Orthodox leaders on Saturday approved the creation of a unified church independent of the Moscow Patriarchate and elected a leader to head the new church, officials said. A new head of an independent Ukrainian church, Metropolitan of Kyiv Epiphanius, greets people gathered to support a new, independent Ukrainian church near the St. Sophia Cathedral in Kyiv, Ukraine, Dec. 15, 2018. The vote, which was held Saturday at a closed-door synod in Kiev's St. Sophia Cathedral, is certain to anger authorities in Russia. "God heard our appeals and gave us this anticipated unity,'' Epiphanius told a crowd of thousands who had gathered outside the cathedral. He stressed that the new church's doors would be open to all, and encouraged Ukrainians to rally behind it. The newly formed community is now expected to receive independence from the Ecumenical Patriarchate of Constantinople, the Istanbul-based institution considered the so-called "first among equals'' of leaders of the world's Orthodox churches. 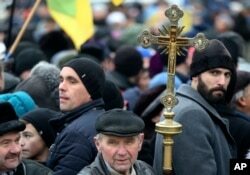 It has already drafted a charter for an independent Ukrainian church. Ukrainian President Petro Poroshenko, who has made the creation of a new church a key campaign issue, attended the synod as a non-voting observer. "Ukraine was not, is not and will not be the canonical territory of the Russian church,'' Poroshenko told the gathering of Orthodox officials on Saturday. He added that an independent Ukrainian Orthodox Church was now a matter of national security. Poroshenko said he would travel with Epiphanius to Istanbul in January to receive an official Tomos from the head of global Orthodoxy granting the new church independence. Representatives of Ukraine's three Orthodox churches attended the synod, but only two from the branch loyal to Moscow showed up. The Russian Orthodox Church has protested vigorously against Kyiv's attempts to create an independent church. One Russian bishop — Metropolitan Hilarion in Volokolamsk — on Saturday compared the two representatives of the Moscow-backed church to Judas. A man holds an Orthodox cross as people support an independent Ukrainian church near the St. Sophia Cathedral in Kyiv, Ukraine, Dec. 15, 2018.